This part we kept from the original: Heat 5 tablespoons butter in a 2-quart heavy saucepan over moderate heat until foam subsides. Whisk in flour and cook roux, whisking, until pale golden, about 2 minutes. Gradually add milk and broth, whisking, and bring to a boil, whisking. Reduce heat and simmer gently, whisking frequently, until velouté sauce is silky and thick, about 25 minutes. Meanwhile cook the chicken over medium high heat in a pan with a little olive oil. I’d add the shallot here, but we didn’t have one…When almost done add the mushrooms. Cook until most of the juices have been released and cooked off. Add the sherry and asparagus and cook a few minutes longer until the asparagus is tender. In one of the pans if they are big enough, or another bowl, mix the sauce (reserving ~1 cup) and the chicken, mushrooms and asparagus. Mix the flour, salt and nutmeg in bowl. In another bowl (or a 2c measuring cup) add the milk, egg, and egg yoke and lightly beat. Add the milk and egg mixture to the flour and whisk well. Heat an 8in pan over medium heat. Melt a little butter and spread around. Add ~1/4 cup batter and spread. Cook crepe until golden brown on the bottom (~40-50 seconds). If you want, you can flip and cook the other side for ~10 seconds. Pile the crepes on a plate. 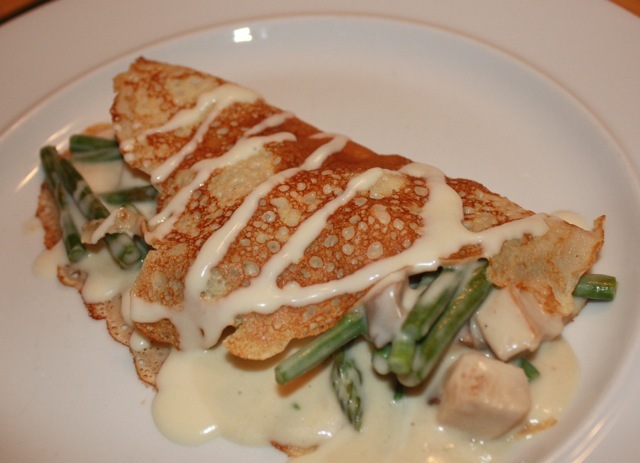 Put a crepe on a plate, add some filling, fold over and drizzle some of the reserved sauce on top. Enjoy! *We accidentally used cream instead of milk…while I am sure that added to the deliciousness of the dish, I’d stick with the milk in future. We also forgot to add the sherry.